This Sunday was so beautiful, finally no rain in Jersey; I was able to brew out side and my best Friend from Virginia Beach was visiting and helped out. This brewing Session was my first time brewing a Roggenbier, which is basically rye version of a dunkelweizen. This should be a nice light summer beer. It’s been a long time since I brewed outside, felt a bit clumsy, but it was so nice I couldn’t pass up the opportunity. First up we got our mash water going looking for a temp of 170° so we would have a mash temp of 155°. While we were waiting for the water to heat up, we started the labor intensive process of grinding 9lbs of grain with a tiny grain crusher. The itsy bitsy hopper only holds about a pound of grain, it took a while to crush the grain. 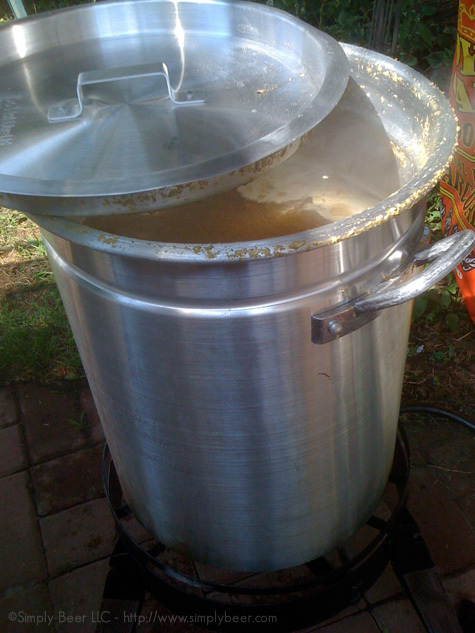 With our Hot water at 172° we added 2.8 gal of hot water to the mush tun and stirred in the 9lbs of grain. We ended up about 2° over our strike temp, but 2 handfuls of ice brought the temp right down to 155°. We let this mash for 60 minutes. With about 20 minutes left we started to heat up our sparge water to 170°. After we got to temperature, we filled up the hot tank and set up the sparge arm. (I’m leaving out the sanitizing details, that is assumed). After 60 minutes of mashing, we poured off the bits of grain that got though the false bottom and sparged the grain for about 50 minutes, filling up the brew kettle to 6 gallons. I brought the wort up to a boil. I’m using a new 50k BTU burner and it is touchy, it requires constant attention to avoid boil overs, or I need a larger boil kettle. At the start of the boil I added .5oz of Hallertau Hops then at 30 minutes added 1oz of Tettnang Hops. After the 60 minute boil, with a wort Chiller, I brought the temperature down to 80 degrees. Poured the wort through a fine metal mesh into the empty Hot liquor tank. 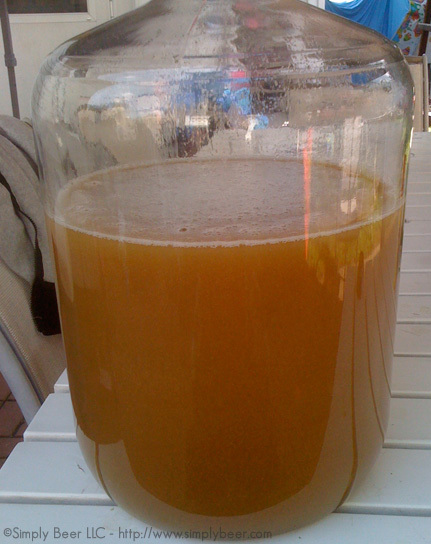 From there drained it into a 6.5 gal glass carboy. Took Original Gravity measurement. The expected range was 1.044-1.048, ours was 1.048. We hit our mark! 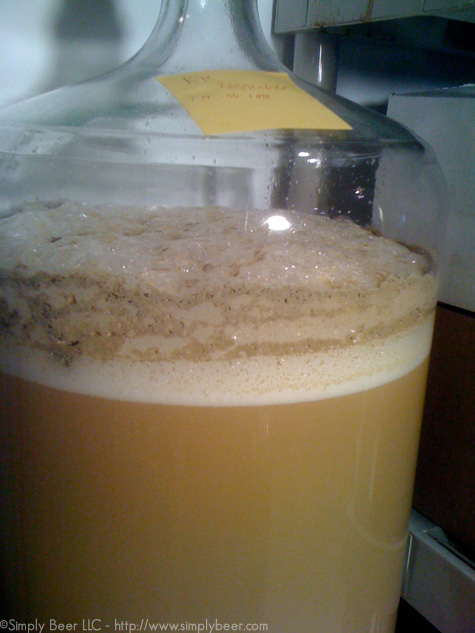 I then added my yeast starter (Wyeast Bavarian Wheat # 3056) to the primary. I’ve never done a roggenbier, but have had a few homebrewed versions from friends and they are definitely a tasty beer. I also have issues with the boil overs, I have to watch the burner like a hawk once things get rolling, especially after you add hops and nucleation takes place. I notice you have a lid on your pot…not sure if you’re completely covering during the boil, but I’ve read that can cause issues with DMS. I only had the cover on halfway (like the picture) to reduce the risk of something blowing in. I had 2 boil overs… piss me off. the second was 30 sec after adding the hops I probably lost a good bit of hops. But life happens…. move on hope for the best. Losing hops like that is the worst, happened to me many times. I’m always afraid to brew outside…that a storm will come up or a bird fly into the brew. All unreasonable fears. That wort already looks delicious! yeah, i was more anxious then usual. I think I’ll move back to the garage.